Kendra Puckett sat in Classroom Unit 1 before her legal studies final in spring 2014. She was up all night studying for the 8 a.m. exam. So she skipped breakfast. “There was a person next to me eating a protein bar. I was like, ‘Wow this is going to be really embarrassing because I’m going to have to ask for a piece of this,’” Puckett said. Now an alumna, Puckett is from Newbury Park, a medium-sized suburb one hours drive north of Los Angeles on a good day. She moved to Santa Cruz in 2007, enrolling at Cabrillo College where her class fees were covered by a government program. It wasn’t until transferring to UC Santa Cruz in fall 2013 that money became an issue and food a lower priority. For students, food insecurity is a spectrum stemming from a lack of time, location, finances or any combination of the three. Someone who regularly eats at fast food places to save money and someone who skips meals entirely are both food insecure, but in different ways. This leads to mental, physical and emotional issues down the line, said Counseling and Psychological Services (CAPS) Director Gary Dunn. “If you are spending time worrying about [when your next meal will be] you aren’t studying, you aren’t going to class and these things start multiplying on each other,” Dunn said. As defined by the UC, access to healthy and affordable foods is part of food security. Santa Cruz is the fifth-most expensive metropolitan area in the country for renters. To afford a two-bedroom unit without spending more than 30 percent of income on housing, a Santa Cruz tenant needs to work full-time and make $33.77 an hour — a figure out of the question for most full-time college students. As a student, Puckett had two part-time jobs and nannied on the side. Her paychecks were about $400 biweekly. Alumna Kendra Puckett shares her experience with food insecurity that began when she transferred to UC Santa Cruz in fall 2013. Photo by Megan Schnabel. 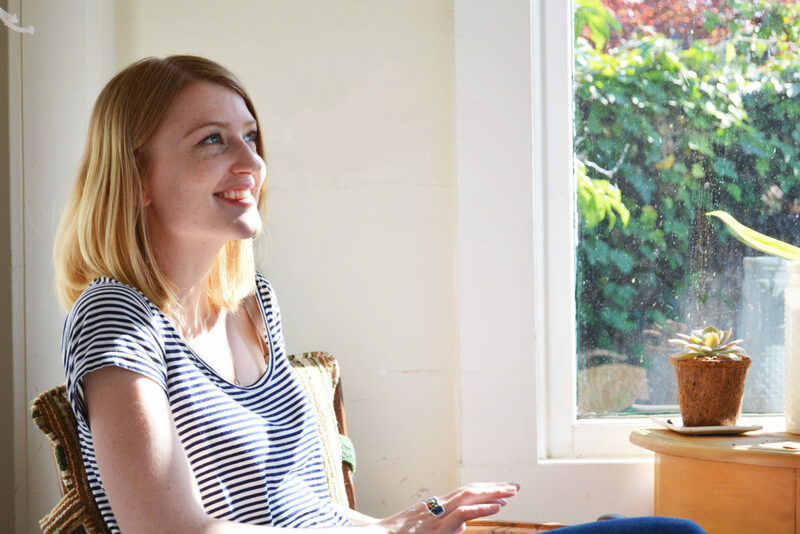 Through loans, Puckett paid for two years at UCSC as a transfer, graduating in June 2015. Her debt totals about $17,000, which, if she stays with her current monthly plan of $177 a month, will take her eight years to pay off. As of March 2016, the average UC undergraduate debt is $20,800. Lunch was the only sure thing for Puckett. When the rent, phone and utility bills loomed, she would skip a few meals to make ends meet — breakfast and dinner were the first to go. This year, UC Office of the President allocated $75,000 per UC campus to begin the Global Food Initiative (GFI) aimed at addressing UC-wide food insecurity. At UCSC, this money has gone to short-term solutions distributed by the Slug Support Program through the Dean of Students (DOS) Office. All students’ cases vary depending on their need, said DOS coordinator Rosalinda Gallegos. Since students experience varying levels of food insecurity, Slug Support tries to accommodate their needs based on available resources. Under GFI, CASFS staff provides resources with Slug Support and helps students sign up for CalFresh, a state-run food stamp program aimed at providing cheaper, healthier food for low-income individuals. But students must work an average of 20 hours per week and not be on a meal plan that covers more than half of their meals to be eligible for CalFresh. For those ineligible for CalFresh, Slug Support’s pantry bags, Safeway cards and dining vouchers provide short-term relief. Funded by Measure 43, the bags provide four to five days worth of dry food for students free of charge. This year, Slug Support spent nearly $7,400 on food assistance compared to the $270 in 2013-14. As of early February, Slug Support issued 640 dining hall passes to students. 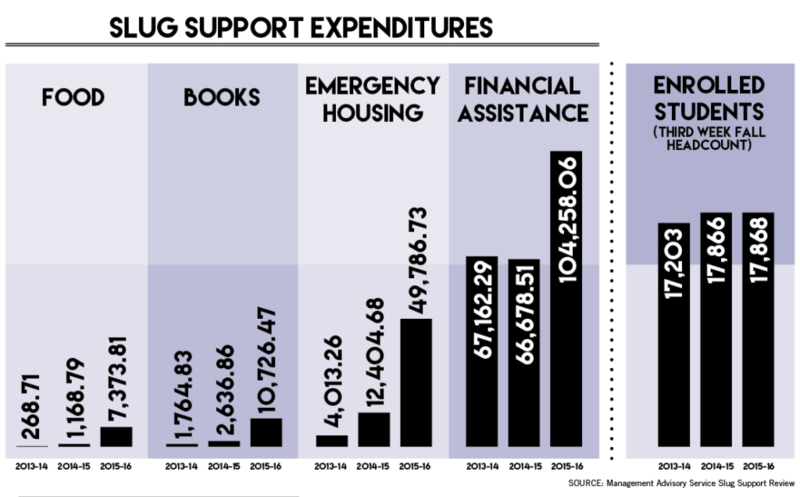 During the first eight months of the 2014-15 fiscal year, Slug Support reported 692 cases with an average of 58 per month. According to a review of Slug Support by Internal Audit & Advisory Services, there were about an additional 200 students seen specifically for food insecurity. 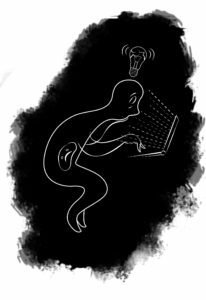 Puckett didn’t find out about Slug Support until her last year at UCSC. She got the pantry bags — filled with white rice, beans, chips, fruit snacks and granola bars — which would tide her over for a few days at a time. Puckett didn’t go grocery shopping very often, but when she did, an empty stomach was a dangerous feat. Whether it was dating to eat, stopping by a local church for meals or hopping the fence of the local bakery to get the leftover bread, Puckett was familiar with ways to get free food in town. “It used to be [that] you could just go and get bread. Then they put up a fence. Then they started pouring bleach all over the bread,” Puckett said. She and her friends would bring backpacks and sneak in at night to take the cinnamon bread or other leftover loaves piled high in outdoor storage bins. For about seven months, CASFS Food Equity and Access specialist Crystal Owings has been working on plans for a centralized food and kitchen space on campus to serve as a hub of information and resources for students. “Ideally we would want a holistic space where students may sign up for CalFresh appointments, learn more about CalFresh, prep [and purchase] meals and snacks, attend or lead free basic cooking and nutrition workshops, and a space for healing,” Owings said. Unlike other UCs, UCSC doesn’t have a centralized food area for students who experience food insecurity, Owings said. 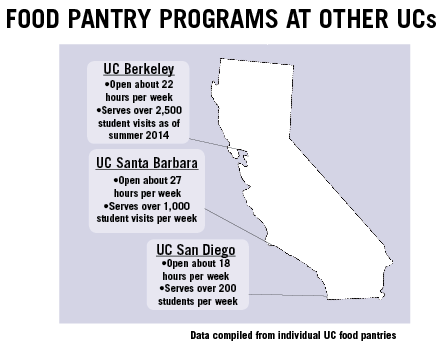 UC Berkeley, UC Santa Barbara and UC San Diego have programs in place supporting a central food pantry for students. 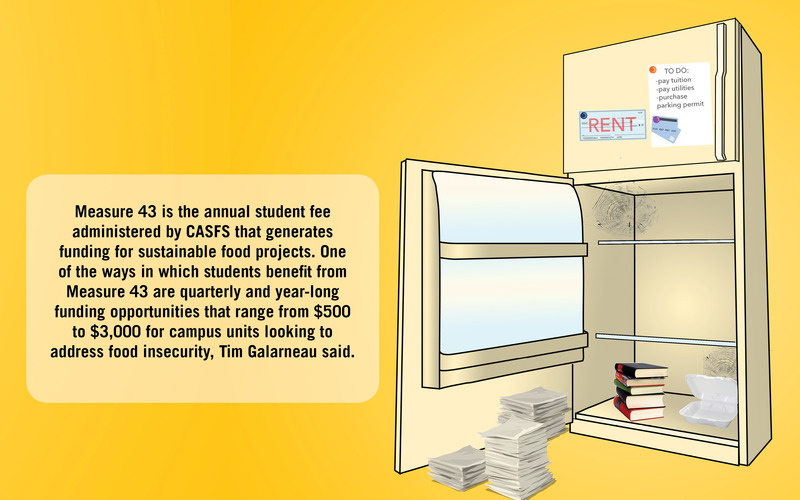 CASFS has the funding to start a space, but hasn’t found a location. Owings said CASFS coordinators have considered several spaces on campus, like the ARCenter and the Redwood Building, but none have been able to accommodate the program’s needs — an industrial refrigerator, a large area for educational cooking classes and a holistic food pantry offering a variety of healthy food options. In spring 2015, UCOP sent out a UC Nutrition Policy “Got Food Survey” to “increase understanding of food access amongst UC students.” Nine thousand students across the UC responded, and although the results of the survey have been complete since November 2015, the findings won’t be released until July because the survey is undergoing “confidential peer review,” said Robin Sanchez, UCOP principal analyst for the Division of Agriculture and Natural Resources. The peer review group is made up of faculty and staff across the country who specialize in statistical data and research in the related field, Sanchez said. Earlier this month UC President Janet Napolitano announced increased GFI funding from $75,000 this year to $151,000 to UCSC for the 2016-17 year, and an additional $151,000 the following year to create student internship positions and fund Slug Support, CASFS and programs that promote education on cooking, shopping and applying for CalFresh. Last month, UCSC dining approved a Swipes for Slugs program under the GFI, which would donate leftover meals to other students in need and operate through the Slug Support program. 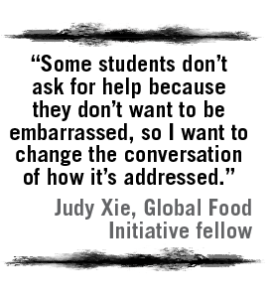 Though it won’t be implemented until at least winter 2017, third-year GFI fellow Judy Xie is hopeful it will bring awareness to the issue. Currently, students can donate leftover meals online or in the dining halls to the Santa Cruz Second Harvest Food Bank at the end of fall quarter. Dining then calculates the cash value of the meals and writes a check to the food bank. Ideally, Xie said Swipes for Slugs will be available winter and spring quarters, with Slug Support continuing to distribute meal vouchers throughout the year. Swipes for Slugs is drawing from the donations process of Second Harvest and other UC campuses that have implemented programs where students donate meals to food centers outside of UCSC. She said it’s important that students are able to help their own community on campus. When midterms hit and she needed food, Kendra Puckett recalled asking her friends to buy and fill 25 cent to-go containers from the dining hall. She said that although her friends were supportive, constantly asking for help is uncomfortable.